Pelekas is a small mountain town, about 13 kilometres far from Corfu town but placed along the opposite coast. Pelekas is a traditional inland Greek village with its churches, its streets and its charm still far from massive tourism. This village rises up on a 270 metres hill, where you can today visit the rests of the ancient Kaiser’s Throne. Due to this historical attraction, Pelekas has become very popular. Don’t miss a visit here also for the 360 stunning view you can admire. Pelekas is not really placed on the sea, but from here you can reach a lovely bay with the beach of Kontogialos. Like in Glyfada, this beach has also white and soft sand and the sea is not very deep. There are two different roads to reach Kondogialos and both offer a stunning view over the beach. 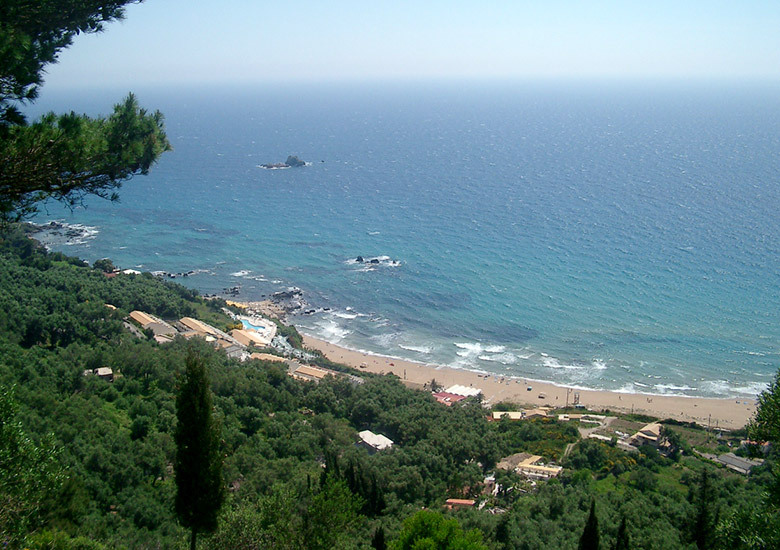 Pelekas is an interesting destination of many organised daily trips around Corfu island. In case you decide to search your accommodation here, we suggest you to have your own vehicle. Pelekas has some local restaurants where you can stop for a break and few tourist shops where you can buy a souvenir from Corfu. Pelekas offers just a different kind of holiday with a great possibility of marvelous walks through the forest. Near Pelekas it is also possible to organize horse riding or to play in an 18 holes golf course. There is no real night life except some local restaurants that play live Greek music in the night. During the last years local people have organized some music events in the central square of the village. Pelekas offer few kind of accommodation such as cheap studios or apartments.